Many of these different types of rock art are also referred to by names and titles given by archaeologists. 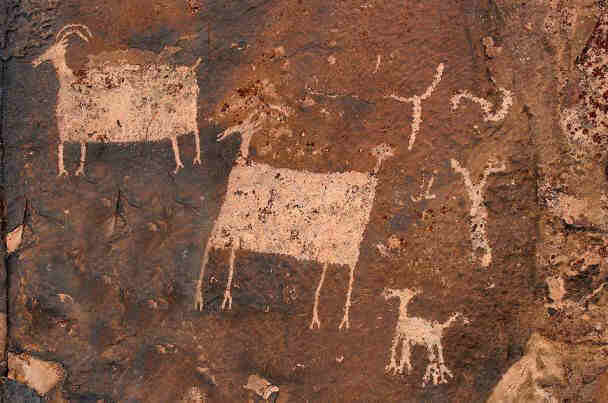 Native American rock art takes three major forms: pictographs, petroglyphs and petroforms. Rock Art is the generic term used to cover all forms of pictures that have been created on rocks. The words and terms used to describe different forms of rock art can be confusing when the subject is first researched. The following terms and definitions are used to describe the different forms of rock art which hopefully will clear any confusion related to the terminology used and the difference between Petroglyphs and Pictograms and all the other 'P' words relating to Rock Art! Pictographs are ancient rock art figures and symbols that are drawn or painted onto a rock face, normally without any pecking or abrasive methods of creating the picture. Paint made from powdered minerals, blood, charcoal, or other substances were used to make pictographs. Pictography means the application of pigments. Pictography means the application of pigments. Pictographs are rock paintings, that were often found in caverns, caves and on rock faces. Pictographs are ancient rock art figures and symbols that are drawn or painted on to a rock face, normally without any pecking or abrasive methods to create the painting. 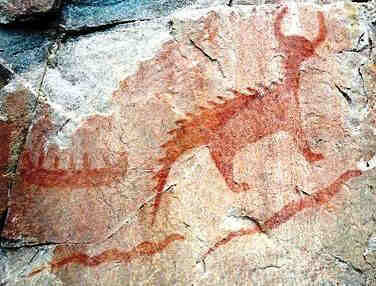 Paint made from powdered minerals, blood, charcoal, or other substances were used to make pictographs. Petroglyphs are rock carvings. Petroglyphs are created by chipping, carving, engraving, scraping or grinding the surface of rocks to reveal a lighter rock of stone beneath. Petroforms are man-made patterns and shapes on the ground that are made by lining down, or piling up, stones, large rocks and boulders. A ‘petroform’ refers to rocks that have been moved into a new formation. The Klamath Tribe, in south-central Oregon, built many rock cairns or petroforms. The meanings of signs and the types of symbols used by Native American Indians are fully illustrated and can be accessed via the Picture Dictionary of Symbols. The symbols dictionary provides information and origin of many symbols that are depicted in Rock Art and includes reference to Native American legends and the mythology of the ancient Mound Builders and the fantastic creatures and monsters that featured in their culture. Discover the vast selection of pictures which relate to the History of Native Americans and illustrate many decorations and tattoos used by American Indians. The pictures show the clothing, tattoos, war paint, weapons and decorations of various Native Indian tribes that can be used as a really useful educational history resource for kids and children of all ages and a means to study their interpretation. We have included pictures to accompany the main topic of this section - Interpretation of Symbol. The videos enable fast access to the images, paintings and pictures together with information and many historical facts. All of the articles, such as the Rock Art, can be accessed via the Native Indian Tribes Index.